Sue teaches yoga classes and individual sessions on Mondays at the Mill in the Seminar Room downstairs – visit www.yoga-with-sue.co.uk. Sue began to practise yoga in India in 1991 at the age of 24 and completed her Teacher Training with the British Wheel of Yoga in 1999. 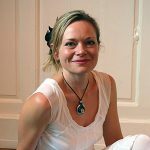 She has continued to attend trainings and retreats with some of the world’s highly respected yoga and meditation teachers as well as osteopaths, physiotherapists and practitioners of other movement and bodywork disciplines. Over the past 18 years, Sue has taught mainstream classes, individual sessions and classes for people with limited mobility, long-term illness, mental health difficulties and learning disabilities as well as carers, children, professional dancers and actors. She has a deep understanding of anatomy and physiology and aims to make yoga accessible to all. Her teaching approach is gentle, helping students to develop awareness of their experience and to discover ways to practise that are enjoyable, useful and appropriate to their individual needs and capabilities.